Dr Zammit Lewis launching the new strategy. 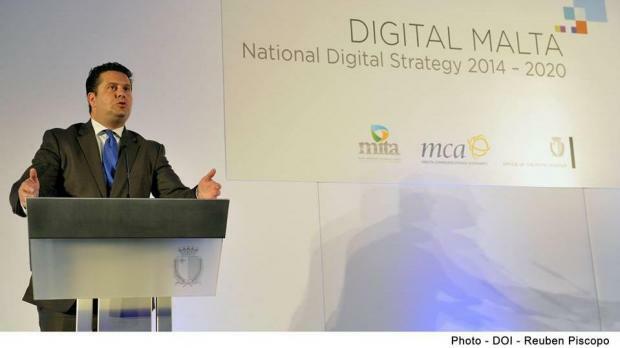 Digital Malta is the name of a national digital strategy launched this morning by Prime Minister Joseph Muscat. The strategy which covers till 2020 is based on three main pillars - citizens, business and the government. The aim is to promote more the use of social networking, mobile applications, bridge the digital divide and promote research and innovation. Other objectives are to promote Malta as a digital hub, seek strategic alliances with multi national companies and improve the government's online platform. The strategy also includes plans for e-democracy through which citizens have their say in certain decisions as part of a commitment to promote open government. The Prime Minister said that the challenge is two fold. One to prepare certain groups within society to familiarise themselves with the digital world. The second is to have a well-prepared public service through better e-government services. He said that it would have been "preposterous" and "self-defeating" if the strategy tried to set its objectives by predicting advances in IT for the next six years. Rather than being a prescriptive strategy this just sets the goals, the prime minister said. He also referred to the new id cards which will serve as an electronic identity. The Prime Minister said that the new id cards will serve as a breakthrough for citizens to use e-government as well as service in the private sector. Parliamentary Secretary Edward Zammit Lewis said that the previous strategy had long expired and no plans were made by the previous administration. He said that small business need to be onboard to have a competitive edge in the globalised economy.